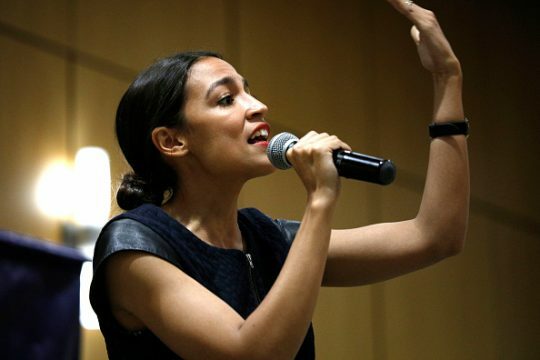 Rep. Alexandria Ocasio-Cortez (D., N.Y.) deleted a tweet that accused a Republican congressman of issuing a racist remark on the House floor. She alleged Rep. Jason Smith (R., Mo.) said something in a story she recounted on Twitter. "Rep. Smith yelled ‘Go Back to Puerto Rico’ so loudly that 2 mothers heard the racist remark from the GALLERY and told me about it later in my office," the freshman lawmaker tweeted Thursday. "And [Smith]: maybe you’re the one who should go to PR so you can see how the GOP is starving Americans in disaster recovery." Smith did indeed yell "go back to Puerto Rico" during a tense showdown over a Democratic bill to fund the government. House Majority Leader Steny Hoyer (D., Md.) told reporters the remark was directed at Rep. Tony Cárdenas (D., Calif.), who is Mexican American and not Puerto Rican. Smith apologized to Cárdenas in a phone call, but insists that the remark was not racially motivated nor directed at him personally. Cárdenas is the chairman of Bold PAC, the fundraising arm of the Congressional Hispanic Caucus that just returned from a weekend trip to Puerto Rico. The trip was heavily criticized by conservative media and President Donald Trump for its timing. Smith said in a statement that he was "speaking to all the Democrats who were down vacationing in Puerto Rico last weekend during the shutdown, not any individual member," saying it was "not true" that the remark was a personal attack. Ocasio-Cortez deleted the tweet three hours later according to Screenshot Bot, a Twitter account that tracks deletions from prominent accounts in real time. This entry was posted in Politics and tagged Alexandria Ocasio-Cortez, House Democrats, House of Representatives, Puerto Rico, Racism. Bookmark the permalink.